The 326Sx Clean Sweep is a unique tool for every clean-up operation from pavement to turf. The Clean Sweep has the power to move materials that are too heavy for a blower, like the debris left by snowplows or construction work. It will even clean turf without damaging the grass. What's more, the 326Sx Clean Sweep has a great power-to-weight ratio and an E-tech engine. 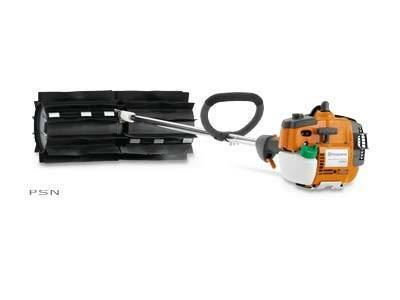 Put Husqvarna's Clean Sweep to work on your tough clean-up jobs! Air purge designed for very easy starting. Transparent fuel tank for checking the fuel level. The E-TECH II engine combines high torque, reduced emissions and low noise with a superior power / weight ratio. Hard chromium plated cylinder bore provide increased durability and extended product life. Soft handles for optimum comfort. Versatile, durable and flexible rubber fins makes work efficient. Forged connecting rod and three-piece crankshaft for extended product life.